This was a year where I saw the endless sky above Montana, smelled the ravages of fire in California, and stood at the edge of the fantastic, sensing and savoring the sublime magnificence of edges along the Grand Canyon. During my travels abroad this summer I tried to keep an eye out for examples of multidisciplinary storytelling. Near the end of my trip I visited the Tate Modern in London and attended an exhibition about art during the Black Power movement. A short review would simply say that Soul of a Nation is stunning, not only because of the way in which the exhibition mixes print, sculpture, and photography to show the visual culture of the movement’s history, but also how artists illustrated emotion and meaning through their work. A quotation from the walls of the National Museum of African American History and Culture. between the unborn, the refugee, the immigrant, and those not living in privilege. Although I am afraid, I am certain. Although I question, I am ready. I can be brave. I must be brave. I will be brave. Pulitzer Prize winning author Anthony Doerr put up this panel during his talk for the Arlington County Library. I wrote about that talk here. Over the last year or so I’ve watched as the new National Museum of African American History and Culture (NMAAHC) rose up on the National Mall. From the outside it felt like an inspired decorative container, monolithic from afar but interwoven and detailed from close up. My impression changed once I stepped inside. Clean lines, curved staircases, and the decorative metalwork of the exterior provided an incredible sense of openness, a constant reminder as I traveled from gallery to gallery that this is a museum embedded in the landscape of the core of Washington D.C.
A foundation. A place to start. In the first post of this series I wrote of how the miniseries Roots and Guy Gavriel Kay’s Children of the Earth and Sky tackled a simple question of individual identity amidst displacement – “Who am I?” But there is a second question that both the show and the book addressed that looks beyond the status quo and the present revealing active identity creation. “Who do I want to be?” is a question that is both aspirational and forward looking. And so two other art/history pieces I experienced this spring – the Smithsonian’s Crosslines and the Folger Shakespeare Library’s District Merchants– demonstrate that not everyone wants or chooses to internalize their heritage in the same way. Rather they make it clear that answering the question “Who do I want to be?” is a combination of conscious and unconscious choices we make in the process of forging identities. “And he, Marin Djivo, younger son of a merchant? What was his life about? Trade? Clever, profitable dealings? He was from a city state that flourished by letting no one hate them enough to do anything disagreeable. Where you are situated in the world, Marin thinks, digging a grave in a Sauradian meadow, shapes how you act in the world. For those of you that are fans of musical theatre the title of this piece may prompt you to belt out a singular name. A man whose identity at the moment of questioning had long been obscured by a series of numbers. A few weeks ago I wrote two separate pieces on a unique art installation at the Dupont Underground in Washington, DC. 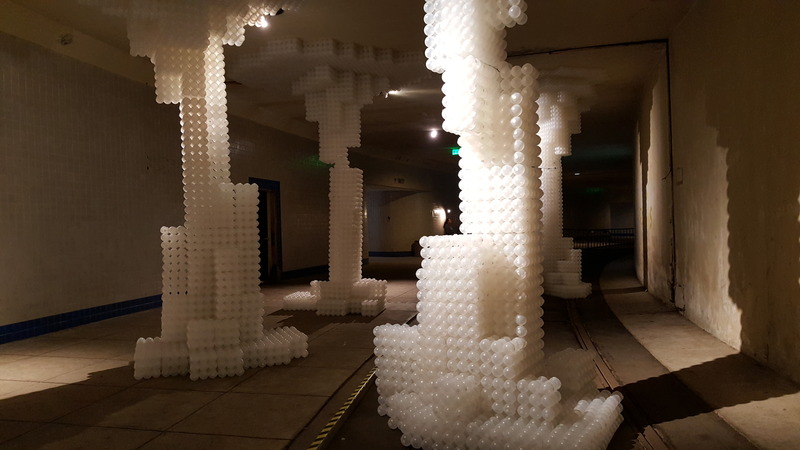 The exhibit took the plastic balls from National Building Museum’s “Beach” exhibition and turned it into an interactive work that looked at the building and re-building of structures. Raise/Raze at the Dupont Underground. Watching #warehouse13. Mrs. Fredrick just said that the “creation of an artifact is the meeting of an object, person and a moment.” #truth. A few weeks ago I attended a tweetup between the National Museum of American History and the United States Holocaust Memorial Museum. Using the hashtag #docsocial twenty social media users gathered to look at the role of documents and primary sources in the telling of history. The objects central to the program were handbags–purses belonging to two women held at Terezin, a camp located in Czechoslovakia that was used as a “model/propoganda” camp. 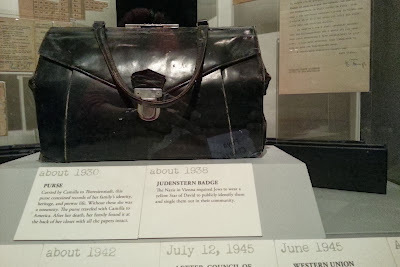 The first belonged to a seamstress, Camilla Gottlieb, and is part of an exhibition at the National Museum of American History called “Camilla’s Purse”. The documents and objects within tell the story of her life at Terezin and later in the United States. The second purse, at the Holocaust Museum, belonged to Helene Reik, who died in the camp–her purse survived because a cousin saved it. Within the handbag was the expected and unexpected: a manicure set, scraps of receipts, and photographs Helene had used as paper, filling every available white space with words.